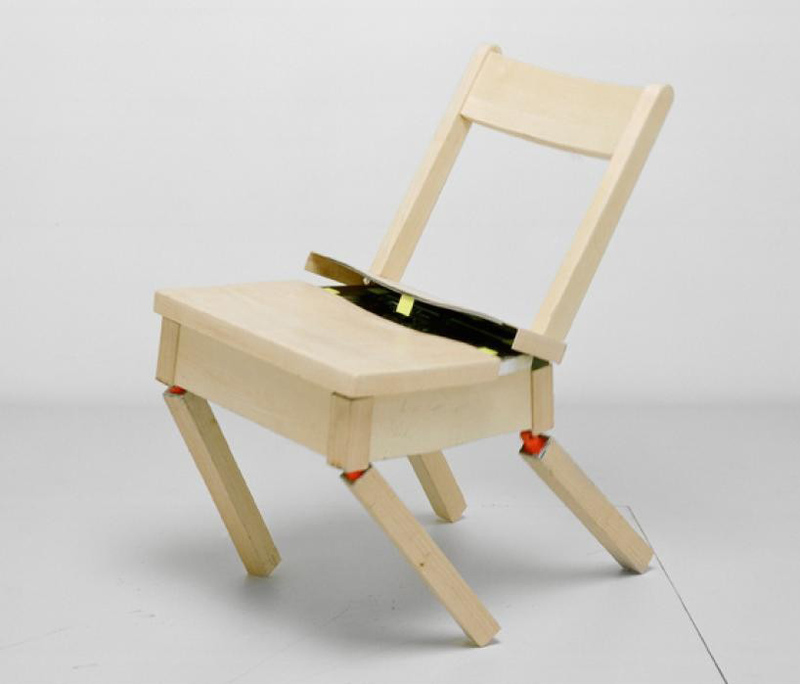 while the ‘robotic chair’ may appear to be a generic piece of wooden furniture, the object has a surprising and quite comical skill set — it can fall apart and put itself back together in a matter of minutes. the brainchild of cornell professor raffaello d’andrea, artist max dean, and industrial designer matt donovan, the robotic seat was dreamed up as early as 1984 as the trio experimented with engineered product applications. finally completed in 2006, the chair was a surprisingly sophisticated piece of technology at the time. today, the ‘robotic chair’ stands as an unassuming example of high-tech, and has been widely exhibited and admired for its unconventional engineering and almost human-like personality. the ‘robotic chair’ is being presented as part of EDIT — a ten-day festival for design, innovation and technology in toronto and produced by design exchange, whose overarching theme for this inaugural edition is ‘prosperity for all’. 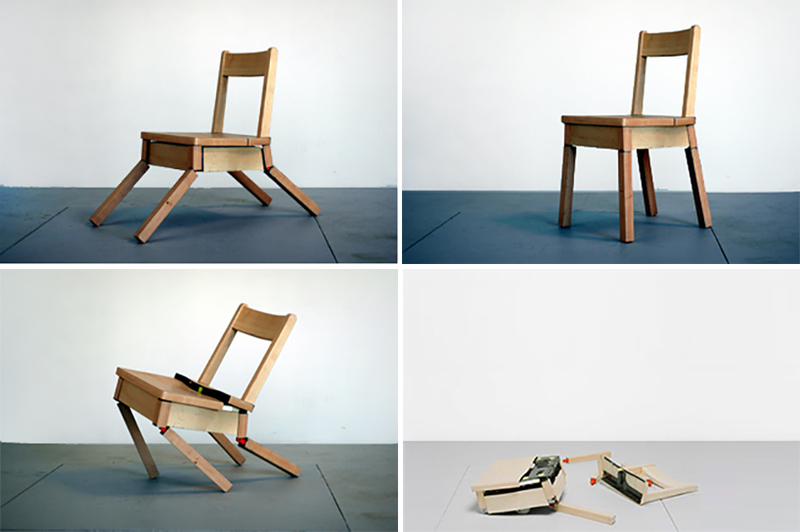 with a huge force, the ‘robotic chair’ collapses to the floor into pieces. guided by an overhead vision system and controlled over a wireless network by an external computer, it then proceeds to search for its missing parts and autonomously re-assemble itself. 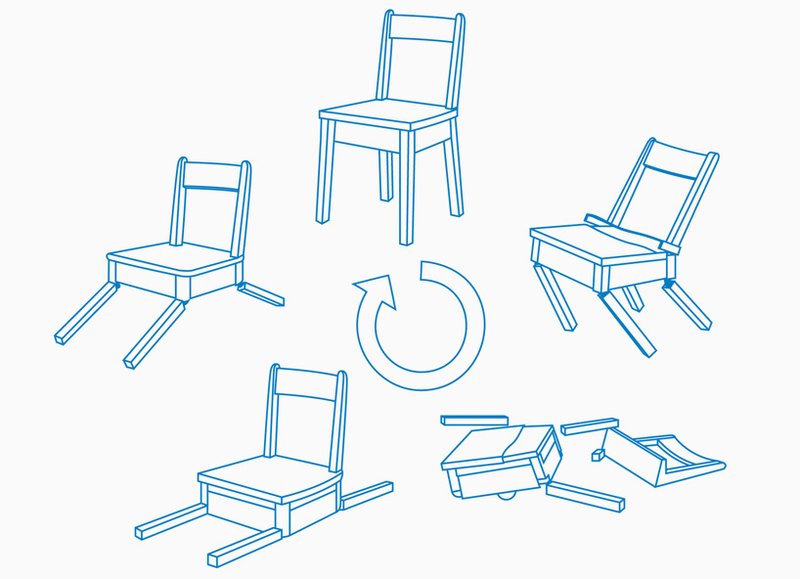 various algorithms govern the chair’s behavior, while the software is structured in such a way that the system can learn from its environment. the robot is given the ambitious task of finding its scattered legs and back, and restoring itself to its original configuration. the chair acts alone, and is not dependent on viewer presence or interaction to perform. the structure comprises: an aluminum chassis, fiberglass and carbon fiber chair with wood veneer, custom mechanical joints, 14 MicroMo electric motors, wheels, battery pack, wireless radio, custom electronic components, laptop computer with custom software, video camera, plywood base with custom kevlar sprung floor and fluorescent lights. despite its numerous, engineered mechanical elements, ‘robotic chair’ stands as a symbolic reminder of the human life cycle – falling apart, picking oneself up and gathering together, again and again. see ‘robotic chair’ at EDIT, the expo for innovation and technology, from september 28 – october 8, 2017.